The All Results Journals: Is time to change the scientific review system? Is time to change the scientific review system? How do we perceive science? How do we get scientific results? Are reviews being made correctly? There are some complex issues that we try to analyze in this post. First, we must emphasize that science is usually a news when it responds to the stimulus cause and effect. When any research gets positive or negative results, even if they are minimal, is when people know about it. But if the research had negative results that force to rethink some of the hypothesis is when the investigations disappear from the media landscape. Is the problem of publication bias which we have told many times at this blog. This problem is affecting the publication of scientific research in generalist media. Although, there are some drawbacks when speaking of specialized media. Usually, scientific journals use a double check system or peer-review system. It is the most widespread standard to verify the veracity of the experiments. However, that does not mean it is the most accurate. Peers usually have the same level of knowledge of the author but they are not usually experts on the specific research to be judged to provide critical views about it. Furthermore, sometimes is difficult to get two independent reviewers to evaluate a manuscript without conflict of interest. In this sense, it is interesting to remember the scandal of false claims by Dr Andrew Wakefield about the MMR vaccine to autism. A journalist, Brian Deer, was ordered to investigate on the research of Dr. Wakefield published in The Lancet in 1998. Deer himself said he had spoken with one of the reviewers of the original document and he had confessed that the reviewer had not read in detail the manuscript but he had approved it because he knew and respected author of the text, Professor John Walker-Smith. It was an event that was discovered in 2004 but The Lancet did not publish any rectification until 2010. Meanwhile, vaccination rates for measles, rubella or mumps were significantly reduced. 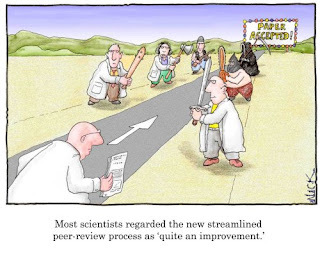 The essence of good peer review is generally practiced in scientific conferences. In them, each speaker face critical questions from the audience. It is the best way to review. Real time peer-review. However, these questions are generally not included in the abstracts. Instead, they publish a dossier with summaries from the research that is being presented. However, few people argue that, despite the effort to get the key concepts, summaries might be partial or even biased, specially when conferences are sponsored by a company, due to the close relationship between the company and the research presented. There is another problem, which affect to people´s conception of scientific research and how people receive information through press release. After an investigation, the organization launches a press release to inform about the discovery. Generally scientific research can be reviewed but not press releases, giving, thus, partial messages to population while important concepts are silenced by non-specialize press which pay more attention to the statement than to verifiable scientific facts. For every reason, we are witnessing a time when it is appropriate to ask whether the standard publishing model is valid and sufficient for the publication of scientific research. Now a new paradigm is opened with Internet and open access publications that allow further review of the publication with on-line commenting capabilities helping to increase the standards of peers evaluation.